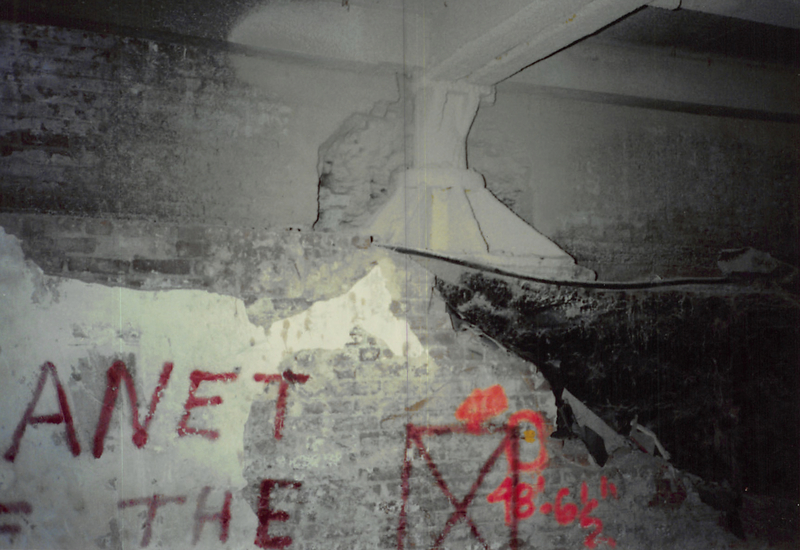 That’s a picture of the cellar of a small commercial building in midtown, taken during a fairly extensive renovation in the 1990s. The metal framing is original, and consists of a round cast-iron column with a cast-iron base plate with vertical stiffeners (the spider-looking thing directly above the spray-painted X), a steel beam just inboard of the brick wall and parallel to it (with a span on either side of the column), and a double girder running from the column off to the right. 1990s: All of the exposed metal was fireproofed during our renovation. As you can see, the fireproofing is spray-on cementitious material. There is no reason to believe that will do an acceptable job on the cast iron, as spray-on relies in part on the base metal acting as a heat sink. (That’s why there are minimum steel beam sizes that can be used with spray-on.) Cast iron may be an effective heat sink, but it’s also subject to brittle fracture from thermal stress. I was overruled on this topic on this project. 1903: Wide-flange steel beams had been invented and were in use, but when this building was constructed they were still under patent protection in the US, so they were only manufactured by one company (Bethlehem Steel) and were more expensive than the alternatives. One of the alternatives for a girder was to use a double I-beam, and Hey! that’s what we have here. The cast-iron column and flanged base plate were dying technology but still economical for a small building like this. Mid-1800s: Take a look at the brick wall next to the column base plate. See the way the brick has been removed to allow the base plate to be set on the big masonry wall that serves as its footing? That doesn’t make sense if the wall was built with the column but it makes perfect sense if the wall (this is the side, along the lot line) was reused from the previous building on site. Such reuse was common in the nineteenth and early twentieth centuries: if your walls are simply large masses of unreinforced masonry, what does it matter when that brick was laid? The glib conclusion: a palimpsest. A possibly more useful one: All buildings are a compilation of elements from different eras, possibly including some older than the building’s construction. Part of understanding a building’s current state is to understand what’s in it and when it was built.